Free standing control cabinets, suites of cabinets, industrial cabinets for many purposes, all share the need for secure door closure and sealing – which is where we come in with our package of “everything but the cabinet”. 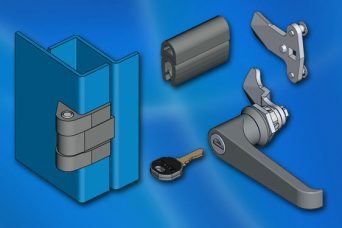 Typically, door closure is taken care of with a traditional L handle such as the 1000 program, either non-locking or key locked and available in chrome or black zinc die, as well as in polyamide. Manual operation is normally facilitated by one of our modular rod locking systems – using either round or flat rods supported by a choice of some 17 rod guide designs which enable robust and quick assembly of a multi-point closure system. Multi-point closure implies a compressible gasket to provide sealing and a suitable solution is often the 1011 series of clip-on “P” section sealing strips which grip the cabinet flange so as to seal on the door. Hinging for such an installation is often provided by the 1110 program of quick-fit 180° hinges. These robust chrome or black zinc die hinges may be rapidly fitted/demounted by virtue of their pull out retaining hinge pin with the whole assembly securely concealed behind the door flange. 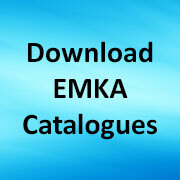 Share the post "Hardware package for specialist industrial cabinets"